Steve Gurko received degrees from Amherst College, Harvard Law School and New York University. After 35 years, he retired as a practicing attorney. He had financial success but had no thoughts about the need for God in his life. In all his years of formal education, he was never exposed to the Bible, even as English literature. During nature walks in the mountains of Colorado, questions came to Steve about the origin of the universe. He reasoned: as surely as a watch needs a watchmaker, nature must have had a designer and maker. 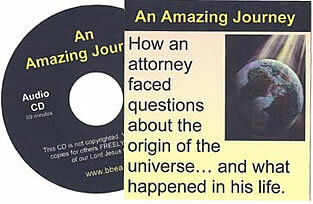 Steve is humbled at WHAT GOD DID to answer those questions and he explains that amazing story step-by-step on this Audio CD. Once a year, just out of curiosity, Steve visited a different church. One year he visited the Rocky Mountain Bible church in Frisco, Colorado, 70 miles west of Denver. What he heard started his quest to know more about the God of the Bible. During that Amazing Journey several people and things helped Steve get answers to his questions. For example, he tells that while visiting in a home of friends, he saw a "Bible Map" chart. He said, "It was a pictorial representation of the "Plan of the Ages" as set forth in the Bible, from eternity past to eternity future..."
Steve told this story of his Amazing Journey to a meeting of attorneys. However, he knows his quest was not uncommon among people of all walks of life. We hope you enjoying hearing and sharing Steve's story on this Audio CD. This CD is not copyrighted, so you're welcome to make copies for others. Steve Gurko also wrote a thought-provoking document, "How to know that the Bible is literally true." It can be freely downloaded worldwide with the "English Products" link on our website.